The Maryland State Department of Education (MSDE) announced this morning that Waterloo Elementary School is one of six Maryland public schools to receive the State’s Blue Ribbon award for 2017–2018. 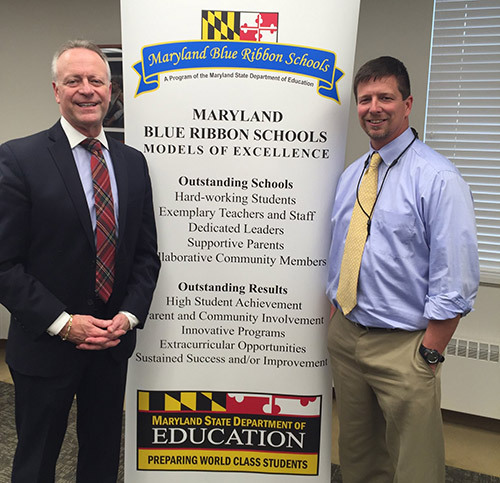 The Blue Ribbon Schools Program is a state and national program that recognizes and honors schools that exhibit high performance and/or significant improvement in reading and mathematics achievement as measured by Maryland assessments. Each 2017–2018 Maryland Blue Ribbon School was selected in the category of exemplary high achieving school, having scored in the top 15 percent of all Maryland schools on the 2017 PARCC assessments. Sixty percent of all Waterloo students met or exceeded expectations in math and English language arts on the 2017 PARCC assessments. Student teams from Waterloo earned top three honors in the Rube Goldberg and Safe Racer Engineering Challenges. Over a dozen students were chosen to participate in the Howard County Public School System (HCPSS) Band and Strings Honors and GT groups. Over 60 students participated in the Girls on the Run and Let Me Run programs, which prepares participating students to compete in a 5K race. As a Certified Green School, Waterloo students planted 122 trees around the school and created, landscaped and maintain a rain garden. 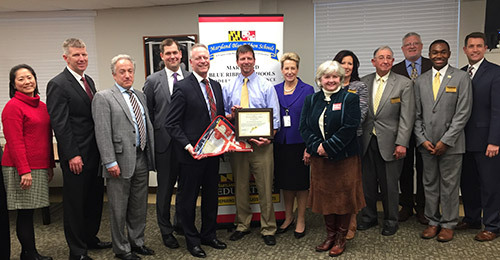 Waterloo Elementary is the eleventh HCPSS school to earn a Maryland Blue Ribbon award. Other schools earning Blue Ribbon honors in prior years include Centennial Lane, Clarksville, and Manor Woods elementary schools, Burleigh Manor, Clarksville, Ellicott Mills, Folly Quarter, Hammond and Lime Kiln middle schools, and River Hill High School. Maryland Blue Ribbon Schools go on to compete for National Blue Ribbon Awards, which will be announced by the U.S. Department of Education next fall. As part of the state award, each school will receive a Maryland Blue Ribbon Flag, a monetary prize, interactive technology equipment, $1,000 of office supplies, and a school congratulations party. The Maryland House of Delegates and Senate will honor each Blue Ribbon School at an awards dinner in Annapolis on March 12, 2018.